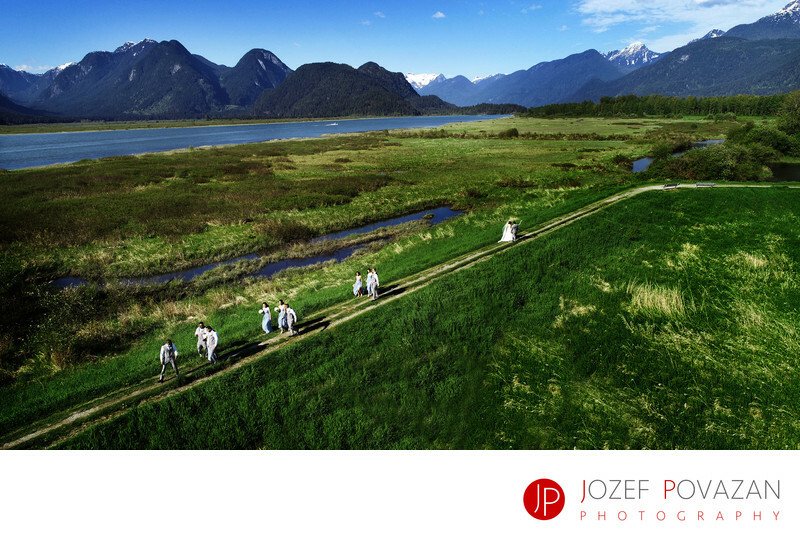 Swan-e-set Wedding pictures drone bride and groom fun - Best Vancouver wedding photographer Jozef Povazan Photography studio. Swan-e-set Wedding pictures of bride and groom fun with their bridal party running in fields at Pitt River by Vancouver wedding photographer Jozef Povazan. What an amazing nature we have here in BC, no wonder we call it beautiful British Columbia for a reason. This portrait of bridal party walking in the grass fields at Pitt River just pass Swan-e-set Golf and Country club where then later on these youngsters rocked the night during their wedding reception. DJI drone helped us here to get an extra vintage point to freeze this frame of memories for them forever.